The Supconnect Awards party was met with a room filled with a room of over 700 people. ORLANDO, Florida - With over two months of anticipation built up towards the Supconnect Editor’s Choice Awards Party in conjunction with the AWSI at the Surf Expo in Orlando, Florida, the evening went off without a hitch. 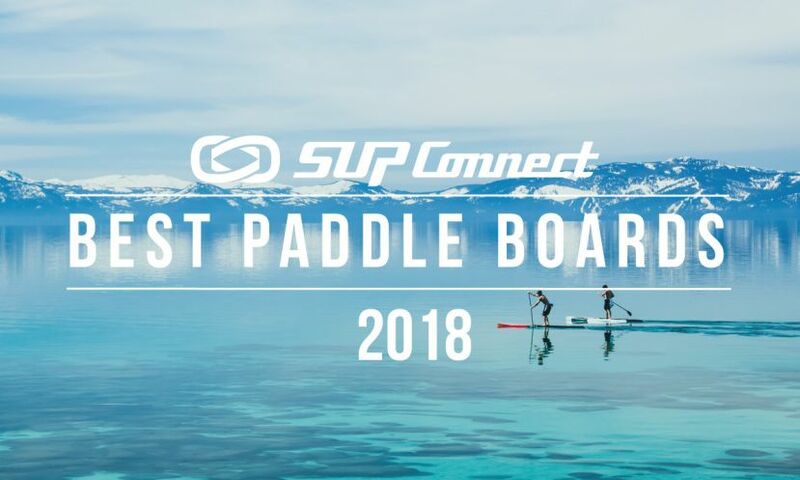 The Supconnect Editor’s Choice Awards were held alongside the Windsurf and Kitesurf Awards that were also hosted by the AWSI in a room packed with over 700 people, which was more than double the crowd of last year's party. Countless emails exchanged, personal meetings and phone calls all to gather input. The party was held on Friday the 11th, immediately following the Surf Expo show. There was a ton of free food on-hand and the free beer provided by Kona Brewing Company was flowing through the veins of the industry professionals, athletes and fans who were filled with anticipation as they awaited the results. The energy in the room was fantastic and brimming with excitement and it was standing-room only as the room overflowed out into the hallway of the South Concourse at the Orlando Convention Center. Pictured: (left) the Supconnect Awards Trophies (right) Caren Forbes of Starboard SUP and Allie Brown, Supconnect Editor. Click here to see the full list of winners for the 2015 Supconnect Editor's Choice Awards. "The spectacular success of the event was truly the result of a phenomenal group effort, from industry and consumer involvement to the hard work of those behind the scene and more," says Andre Niemeyer, Supconnect's Publisher. "Matt Aiken from AWSI and the Supconnect staff devoted countless hours toward making it all possible. While Aiken was diligently working behind the scenes on event details, the Supconnect staff was processing over 30,000 interactions from consumers and industry members. After all the votes, emails, and personal meetings, the result of the process truly stands on its own, as the credible voice of the sport. We couldn't be more excited and look forward to yet an even better event next year." Clockwise: 1. Caren & Svein from Starboard accept the trophies on behalf of Fiona Wylde, the chosen female for Supconnect Woman of the Year. 2. Holly Evans accepts the trophy on behalf of Steve Gates of Big Winds for Shop of the Year. 3. Tyler Callaway of FCS accepts the trophy for Danny Ching, the chosen Man of the Year. 4. Team SIC Maui wins Brand of the Year. Three industries gathered together to celebrate their athletes, brands, and retailers and the night couldn't have gone any better. Word on the street is that for next year's party the Supconnect/AWSI awards will be moved to the largest room in the convention center to accommodate even more people, as it was obvious that they had outgrown their current setup. Supconnect is beyond excited at the prospect of this move and is already planning to make the 2016 Supconnect Editor's Choice Awards bigger than ever! Until then, Supconnect would like to send a huge thank you to all of the sponsors involved, Turtle Bay Resorts, Maui Jim Sunglasses, Kona Brewing Company and of course the AWSI for all of the hard work and dedication that were put into making this event a success. To see more news and highlights surrounding the Supconnect Awards, click here. The Supconnect Awards started in 2010 as a way of recognizing individuals that made exceptional contributions to the sport. As such, it’s the world’s first and original awards in the stand up paddle industry. Unlike most awards, winners are not chosen strictly on athletic performance and results. The ultimate objective of the Supconnect Awards is to help to create positive icons for the youth in order to increase the longevity of the sport for generations to come. And what’s more, it also aims at recognizing exceptional brands, products, and shops that help raise the bar in their field, serving as blueprints of excellence for others to follow. In that light, do not expect the usual run-of-the-mill winners. Nominees and winners, at least we hope, capture the all-inclusive culture of the sport, with friendly smiles and awe-inspiring stories and, yes, performances.